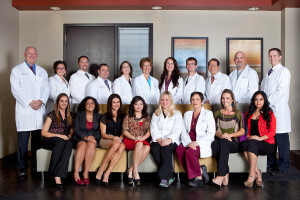 Phoenix CyberKnife and Radiation Oncology Center is one of the leading cancer treatment centers in Arizona. We are the only cancer center in the state to offer the advanced CyberKnife System. At Phoenix CyberKnife, we offer the most advanced radiation therapy treatments and we work with your doctors to find the ideal treatment for your unique condition, whether as a standalone treatment or in conjunction with other treatments such as chemotherapy or surgery. The CyberKnife System is alternative surgery that is completely non-invasive and it is completed as an outpatient procedure. Despite its name, CyberKnife doesn’t use a knife but highly-targeted radiation delivery through a robotic system. This system targets cancer cells and tumors with sub-millimeter accuracy. It is the only system that is able to track the tumor’s subtle movements in real time during treatment. Prior to treatment, a patient will undergo a CT scan in order to determine the exact shape and location of the tumor. These images will be uploaded into the CyberKnife System in order to target the tumor directly. On the day of the procedure, patients lie comfortably in a body cradle without being constricted by uncomfortable head or body frames. The CyberKnife robotic system moves around the body delivering radiation to the tumor from multiple angles. A patient’s body movement is tracked throughout the procedure and the CyberKnife System adjusts accordingly. Patients complete their treatment within five days and are able to carry on with their daily lives. The CyberKnife System can be used in conjunction with other methods of treatment or as a standalone treatment. Phoenix CyberKnife & Radiation Oncology Center treats lung, breast, prostate, brain, and many other types of cancer through the CyberKnife treatment process. Unlike traditional cancer treatments, CyberKnife is a non-invasive treatment option. Because no incision is made, there is no painful recovery that is often associated with surgery, and can go home and resume their lives the very same day. There are minimal side effects because of the precise, non-invasive treatment. Because the CyberKnife System uses real-time tumor tracking, patients can breathe normally, requiring no frames to hold the patient still. This procedure doesn’t require anesthesia or hospitalization like conventional cancer treatments. CyberKnife offers an option for patients who, for medical or other reasons, cannot undergo traditional cancer treatments. CyberKnife can treat inoperable or surgically complex tumors with ease. While results may vary depending on the type of cancer, CyberKnife has been giving hope to cancer patients for years. The Phoenix CyberKnife and Radiation Oncology Center is the only center in Phoenix and the surrounding area that can offer this advanced cancer treatment. Contact us today for further questions.